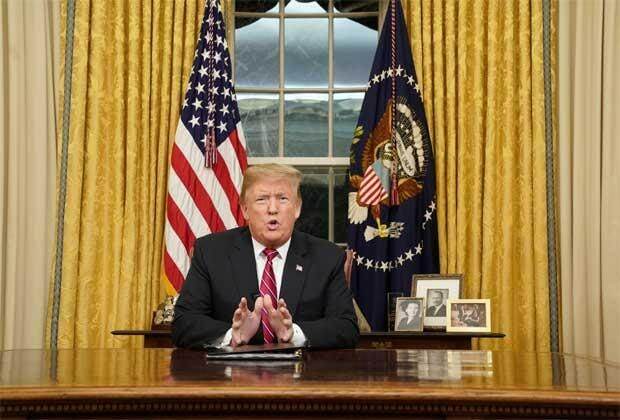 US President Donald Trump said that he doubts lawmakers will reach a deal over the new border wall funding that he will accept and said he would build it anyway with emergency powers if necessary, the Wall Street Journal said in a report. Trump said he thinks the chances of a new deal being reached before the government shuts down again because of lack of funding in less than three weeks are "less than 50-50", CNN quoted the Journal report as saying on Sunday. Another government shutdown is "certainly an option", Trump said. Trump's reported comments come after the longest government shutdown in US history ended on Friday. The shutdown that began on December 22 lasted for more than a month and led to hundreds of thousands of government employees missing two paychecks as Trump demanded new funding for the US-Mexico border wall, which Democrats refused. The agreement Trump signed on Friday that temporarily reopened the government does not provide any new money for the wall. When asked by the Journal if he would accept less than $5.7 billion to build the wall, Trump said: "I doubt it... I have to do it right." Trump told the Journal that he doubts he would agree to a pathway to citizenship for undocumented immigrants who were brought to the US illegally when they were children, known as Dreamers, in exchange for new border wall funding. "That's a separate subject to be taken up at a separate time," he said. Last week, the President offered temporary protection for some undocumented immigrants in exchange for $5.7 billion for his wall, but Democrats swiftly rejected the proposal, CNN reported. House Speaker Nancy Pelosi said Trump's offer was a "non-starter". When asked by the Journal about the kind of barrier he would accept on the southern border, Trump said: "I have to see what it is. As long as it can stop criminals, gangs, human trafficking and drugs, I'm open to anything. But the only thing that will work is a very strong form of physical barrier."